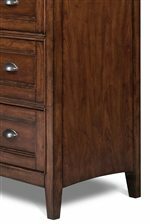 This traditional dresser in cherry wood will give your bedroom a refined look. 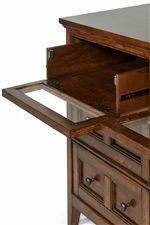 This unit serve multiple purposes, with seven spacious drawers for storage, and a top drawer with drop down front to easily fit electronics components. This piece is beautifully accented with antique brass hardware. The Harrison Double Dresser With 7 Drawers and Drop Down Front On Top Center by Magnussen Home at AHFA in the area. Product availability may vary. Contact us for the most current availability on this product.